Size Shipped Range From 1" - 1.5"
The beautiful colouration and endearing personality of the black and white ocellaris clown fish has made it a favorite of the neophyte and experienced aquarist alike.The black and white ocellaris clown fishes occurs naturally in magnificient and carpet anemones. The black and white ocellaris clown fish has three white stripes with vibrant black pallets on its body . Ocellaris is often confused with A. Percula, because of their coloration and stripe patter. The discerning difference is that A Ocellaris has 11 dorsal spines, where A. Percula has 9 or 10. A. Ocellaris is often bred in captivity making it a very hardy fish, and good for beginners. It is readily available in the aquarium trade. The black & white ocellaris clown fishes are rarely available to the trade, are available in tank raised only, wild collected specimens are not available to the trade. Being a passive species, it is adviced to not keep the black and white ocellaris clown fishes with larger, more aggressive clown fishes. 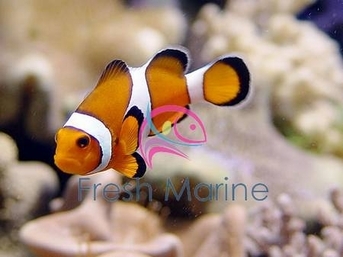 Tank raised clownfish are very hardy and durable fish making them a perfect addition for the novice or seasoned aquarist. If introduced to the aquarium at the same time, many varieties of tank raised clowns can be maintained together in the aquarium. General Size Specifications: The size of the black and white clown fishes vary from �� to �� and are found naturally in Australia. It can attain a length of 3.2" (8 cm) in the wild, but aquarium specimens rarely exceed 2" (5 cm) unless they are imported large. This fish is sometimes sold as the Percula Clown, even though it is not. The color pattern is very similar, but it is not as bright orange. The advantage of the Ocellaris is that it is much hardier. Tank bred specimens are currently available for purchase. Habitat: The Ocellaris Clownfish, also known as the False Percula Clownfish, False Clown Anemonefish, and Anemone Demoiselle, is found associating with anemones throughout the Indo-Pacific. Lifespan: It is a long-lived clownfish that is excellent for the beginner hobbyist. It does best in the presence of anemones such as Heteractis magnifica or Stichodactyla sp. Like the related damselfish, it is well-suited for all but the most predatory tanks. Minimum Tank Size: The minimum size required to store the black and white ocellaris clown fishes in aquarium is of 30 gallon and usually reef aquariums are used to store them. Feeding and Diet: The black and white ocellaris clown fishes are omnivorous and they feed varied diet that include plant material also. This clownfish is an aggressive eater. It will take most meaty foods and frozen herbivore preparations. Breeding: The black and white ocellaris clawn fish like most clown fish breed by laying their eggs near their host anemone. The parents will defend the eggs and will occasionally fan them. After 8 to 9 days the eggs will hatch, about an hour after dark. The fry should then be removed so that predators and the parents will not harm them. The fry will need to be fed baby brine shrimp several times a day. Many of the fry will not survive until maturity. Some other fishes that resemble to the black and white ocellaris clown fishes are Akindynos Clown AUSTRALIA, Akindynos Clown PAIR AUSTRALIA, Allardi Clown, Bicinctus Clown RED SEA, , Fire Clown, Ocellaris Clown, Ocellaris Clownfish TANK RAISED, Orange Skunk Clown, Pink Skunk Clown, , True Percula Clown etc.